How do I exchange my unused season tickets? A benefit included with full season and 20-game memberships, members can exchange their unused tickets from past games to most remaining regular season home games (unused tickets cannot be exchanged into 12/31/18 and 2/16/19). Physical paper tickets must be exchanged at the Zone during regular business hours or at the Box Office on the night of the game. This cannot be completed for you over the phone or via email. Once you exchange your tickets, you cannot exchange them again if they go unused. For better seating selection we recommend exchanging your tickets in advance, perhaps when you already at the arena for a game. If your season tickets are on Flash Seats (and only Flash Seats), you now have the ability to exchange your unused tickets online. Instructions on how to find your unused tickets and to exchange them, click here. How do I access guaranteed giveaways? All Full Season members receive four (4) guaranteed giveaways during the season. On these nights, members can pick up their item on the concourse near Section 120. Once the puck drops, all giveaway items will be available for pick up in Guest Services. Members MUST show their season ticket so they can be marked for item pick-up. Season ticket exchanges are not valid for guaranteed giveaways. Items are only guaranteed on the night of the game. What is the Gun Lake Casino VIP Lounge? Located on the concourse behind The Zone merchandise kiosk, all FULL SEASON MEMBERS have access to the Gun Lake Casino VIP Lounge which offers free popcorn, TV viewing of the game or other sporting events and a private bar. You MUST show your season tickets or member ID badge for entry. Where can I find the "Members Only" concession lines? Full/20/10 season ticket members can enjoy an exclusive "members only" concession line on determined days at specific locations. Members must show their ticket or, if a full season member, their ID badge. Fridays and New Year's Eve – Concessions stands near Sections 110 & 120 only. Saturday & Sundays – Concessions stands near Section 120 only. Wednesdays – Concessions stands near Section 120 only. The stand near Section 110 may be open based on expected attendance. Where are the "Members Only" entrances and what time can I enter the arena? Full season and 20-game memberships have early access through the designated entrances located at the front of Van Andel Arena off of Fulton Street. To enter and wait inside for the doors to open, you must pass through security at the far right entrance when facing the main entrance. Additionally, there is an exterior entrance at the far left of the main bay of doors designated with a sign attached to the overhang. To wait inside at the main lobby member entrance, you can enter the arena 30 minutes prior to doors opening, typically 5:30 PM for a 7:00 PM start time. Both member entrances officially open 15 minutes prior to the general public, typically at 5:45 PM for a 7:00 PM start time. At this time you can enter the concourse or go to your seats. Arriving closer to game time? We recommend using the exterior member entrance to avoid the crowds in the main entry points. I want to use my High-Five Alley passes, what do I do? As a full season ticket member, you can high five the players moments before they hit the ice for introductions. Full members can find these passes in their season ticket books. Bring your pass to Section 120. You must meet no later than 10 minutes prior to the start of the game. Typically 6:50 PM for a 7:00 PM start time. These passes are one-time use only and must be relinquished at the time of redemption. I want to bid on a game-worn jersey, when and where do jersey auctions happen? 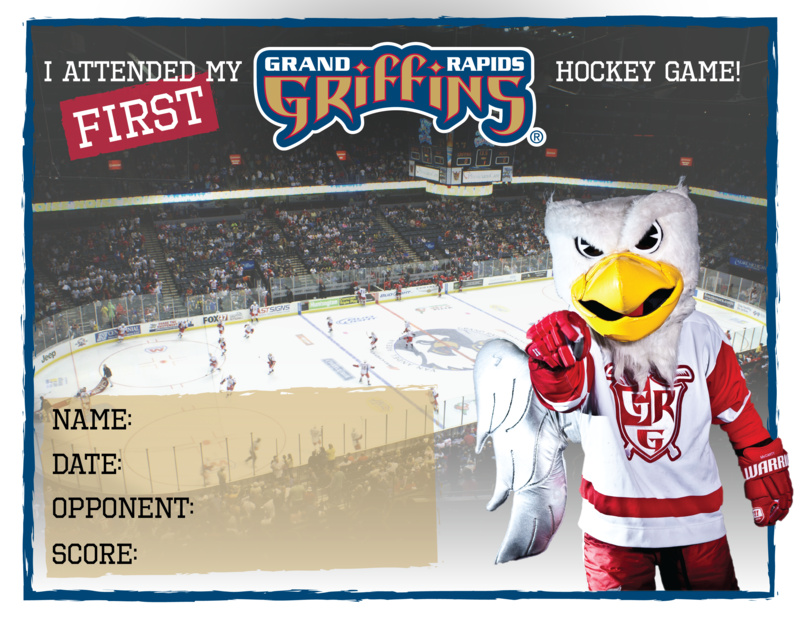 The Griffins hold multiple jersey auctions throughout the season. Jersey auctions are held immediately following the designated games. The jerseys are auctioned off at ice level directed toward the fans in the stands in Sections 121 and 122. Credit cards are accepted and are processed once the winning bid is made at the top of the sections. You can even take home your jersey that night!